Developing the Young Workforce (DYW), West Highland, hosted by Lochaber Chamber of Commerce, have today (date) released a series of inspirational and educational video case studies showcasing apprenticeship programmes in a diverse range of industry sectors across Lochaber, Skye and Wester Ross. They are being released, in advance of Scottish Apprenticeship Week 2019, 04 – 08 March, to inspire young people to focus on the ‘earn whilst you learn’ route as a credible ‘Plan A’ career path. By featuring firsthand accounts of young apprentices working in a variety of businesses across the West Highlands, the five three to six-minute videos effectively outline why apprenticeship programmes offer a credible alternative pathway to young people seeking a high-flying career. They also demonstrate the wide range of industry sectors, apprenticeship programmes and career opportunities available in the region. In the interviews, the apprentices talk about their day-to-day work experiences, what drives their enthusiasm for their apprenticeships, the excellent opportunities they have been given and their hopes for the future as a direct result of their apprenticeships. Their employers are also featured highlighting the fantastic on the job training and other career opportunities their employees gain on apprenticeship programmes, as well as the benefits of apprenticeships to their organisations. The young apprentices, aged between 19 and 22, include Kerry and Morven who are currently working in hospitality at The Lovat Hotel Loch Ness; Padraig who works as a saw doctor and Nico who studies electrical engineering at BSW Timber Group; Robert who works in business administration and Mathew who is an aspiring HGV mechanic at Ferguson Transport & Shipping, and Emily who is working in electrical engineering at Mowi (formally Marine Harvest (Scotland) Ltd). Corpach Boat Builders have also taken the opportunity provided by this DYW West Highland video project to promote apprenticeships and careers available within their organisation. Ian Blackford, MP for Ross, Skye and Lochaber: “Young people are our future and every effort must be made to allow them an accessible pathway into a prosperous beginning in the world of employment. The Developing the Young Workforce West Highland programme has done some exceptional work in producing these videos to highlight the magnitude, and quality, of the apprenticeship programmes available to young people across Lochaber, Skye and Wester Ross. As you can see and hear from the young adults featured; there is a diverse range of opportunities available across various professional sectors. Apprenticeships are an invaluable resource in making pathways into skilled careers affordable to people. Kerry Dickson (22) is in her second year of the Apprenticeship in Hospitality, Scotland Scheme. She went to Ardnamurchan High School. Kerry Dickson and Morven McBean are both employed by The Lovat Hotel Loch Ness, a very popular hotel in Fort Augustus. They are both involved in the three-year Apprenticeship in Hospitality, Scotland programme. They both work on a rotation basis, gaining practical experience in every department within the hotel’s operation. Kerry has really benefited from the great support from the managers in each department. She understands that hard work is required to progress in the hospitality and tourism sector. She is looking forward to the third year of the apprenticeship scheme and building supervisory experience and qualifications. Morven loves learning and earning on the job together with the many benefits of this apprenticeship programme that include free travel, accommodation, apprentice uniforms and laptops. She is keen to progress in food and beverage management on cruise ships once she has finished her third year. Nico Scally (20) and Padraig McNeil (19) – both went to Lochaber High School. At the BSW Timber Group at the Fort William Mill, Nico Scally (20) is an apprentice electrical engineer and Padraig McNeil is an apprentice saw doctor. Nico really benefits from the mix of a college education combined with learning through practical work within the mill. He greatly appreciates the variety of shift work, learning from different people every day. 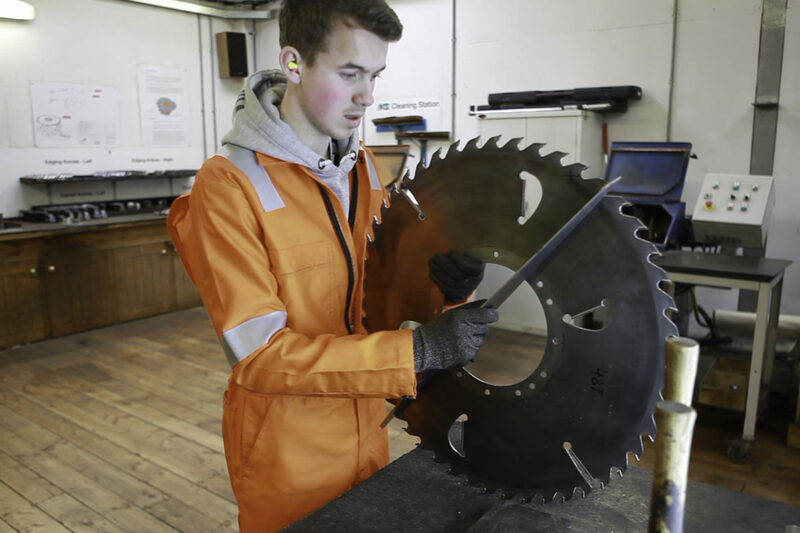 Once qualified Nico wants to continue developing his skills and knowledge within BSW Timber and he hopes to join the apprentice degree programme. For Padraig McNeill (19) his time at college really benefits the practical work on the job. He is keen to progress as far as he can within the company and has already set his sights on becoming head of the saw shop. They both love payday! Robert MacInnes (19) is an apprentice business administrator from Kishorn. He attended Plockton High School. Matthew Weir (19) is an HGV Mechanic apprentice from Corpach. He went to Lochaber High School. He is in the second year of his three-year apprenticeship – fully qualified. Robert MacInnes (19) is an apprentice business administrator and Matthew Weir (19) is an apprentice HGV mechanic with Ferguson Transport & Shipping, one of the largest independent logistics companies in the Highlands. Robert was attracted to this apprenticeship because it offered the opportunity to ‘earn while you learn’, personal and career development on the job, in an organisation local to home. He is able to learn through practical experience whilst studying towards a qualification and further career options within the company. Matthew Weir (19) believes that learning on the job with a local employer is a very special opportunity. He enjoys being paired with qualified mechanics and learning from them when working towards a qualification. Being able to put the theory he learns at college in Glasgow into practice is also of great benefit. Emily Connolly (20) has just entered the second year of an electrical engineering apprenticeship. In total, her apprenticeship is 4 years. She went to Lochaber High School. Emily Connolly (20) is an apprentice electrical engineer for Marine Harvest and works at a number of their sites from Campbelltown to Skye working on everything from wiring houses to fixing generator and pumping systems. She has been put through loads of courses and particularly enjoyed her recent powerboat training. In this video there are no featured apprentices. Corpach Boat Builders are hoping to recruit in the future and have used the video to promote their apprenticeship opportunities. Launched late summer 2016, DYW West Highland forms part of the Scottish Government’s Youth Employment strategy, which aims to ensure young people in Scotland have the skills and confidence needed to make the seamless transition between school and the workforce. There are 21 regional DYW groups in Scotland, leading and driving the change in employers’ engagement with schools and colleges. Working as a synthesis of schools, partner agencies, employers, parents, carers and young people, DYW West Highland’s goal is to bridge the gap between learning and working to allow each respective group to engage with one another, fostering a culture of collaboration through a variety of opportunities. The DYW West Highland team aim to expand opportunities to young people, through employer-led initiatives, so that they gain valuable workplace skills and further education opportunities, making them more attractive to employers. In doing so they can help employers shape the future workforce of the West Highlands and help better prepare young people for the world of work. The DYW West Highland area covers Lochaber, Skye and Wester Ross.